I am so excited to share my Simple Farmhouse Christmas Mantel with you guys today. This post may be a bit late, with only 10 days left until Christmas! Yikes! 10 days??!?! Is that really true?!?! Anyone else in denial?! I'm definitely not ready for the holiday season to be over. If you still have decorating left to do, I'm sharing some super simple ways to deck your mantel out in a Simple Farmhouse Christmas way that you can pull off in no time flat! This is our third Christmas in this house. And we have made some decent progress making this house ours, (see our Mini Kitchen Makeover) but some rooms have gone largely ignored. Ok, completely and absolutely ignored. We've made 0 progress on our dining room, office, and guest bedroom, for example. And there are still updates I want to do in just about every room in the house--including the living room. I'd love to add board and batten on all the walls (I'm testing it out in a hallway now and if you follow me on Instagram, you've already seen a sneak peek at the results! ), replace the media center, and add woven shades to the windows. My sister accuses me of "over-decorating" the living room when so much of the rest of the house is completely undone. She says I re-decorate the mantel in the living room, like 5 times a year. Yep. Guilty as charged. The mantel is hands-down one of my favorite places to decorate. It's so fun to change the space up to fit the seasons or the holidays. So that brings me to my Christmas Mantel 2017. This mantel was essentially the same last year AND the year before for Christmas (gasp! ), so it was definitely time to change up the mantel for Christmas this year. I had a blast doing it, and I'm so excited to share the results with you! First up is the focal point of the mantel, my new scroll. Y'all. I really CANNOT explain just how much I freaking love this scroll. Gorgeous. Simple. Farmhouse. It's everything I love in décor. And it's huge!! It measures 3 feet wide, and the length of the scroll can be adjusted a bit (depending how far you unroll it) to fit your space. Overall, the length is about 3 feet of words, or up to 4 feet, if you include the whole hanging system. The scroll is so lightweight, we simply hung it up with a dressmaker's pin. Haha. Probably not the official way it should be hung, but it was easy, and has stood up against the tests of this family (even when I accidentally crashed my 6-year-old's new drone into it, while showing him how to use the remote control to it!). I am 100% thoroughly in love with this scroll, and I will definitely be adding more to my collection! I've linked the exact scoll below! I flanked the scroll with bottle brush trees wrapped in burlap and other trees I've found throughout the years. I've linked some similar trees below! Under the scroll I placed all the candles I could find. Plus, I'm linking one of my favorite new candle finds from the Hearth and Hand Collection at Target. It's called Sugared Birch and smells so perfectly Christmas-y. Another thing I'm kinda guilty of is getting new stockings waaaaay too often. 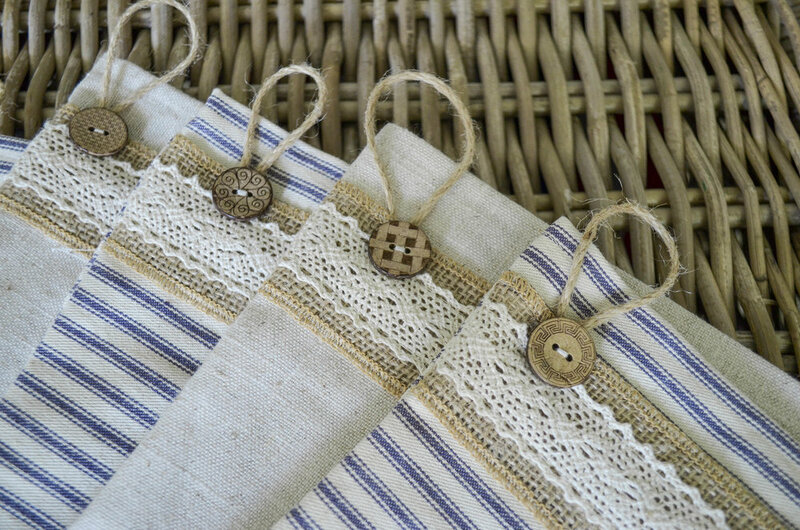 I have been eyeing these farmhouse style ticking stripe stockings from Sarah at Flatcreek Farmhouse forever. And I finally decided to pull the trigger this year and make them my own. And, I absolutely love them. They have those same 3 qualities I love in décor: Gorgeous. Simple. Farmhouse. Yes, please. And y'all, Sarah's customer service is top notch! She checked out my feed, then messaged me to confirm my order, and suggested that I might like the stockings in cream better than the ones I ordered in white, given my décor and my other orders. After I took a second look, I totally agreed! So, thanks to Sarah for her good eye and impeccable customer service! Is it way too geeky to admit that I literally gasped when these arrived? I cannot begin to explain how amazing the quality is. I tugged at the stocking when it arrived and fully examined it, just to be sure. It is top-notch. You will absolutely love these. Look at the detail!! Last year, I just wrote each person's name on a craft paper tag and clipped to the stocking using a mini clothespin. 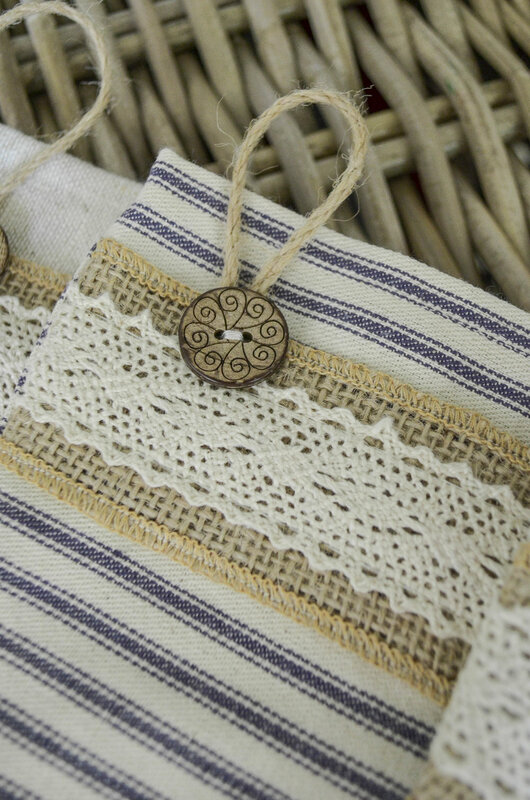 I really loved the rustic home-made look of it, but I wanted to up my stocking tag game this year and spring for something new and more official feeling. 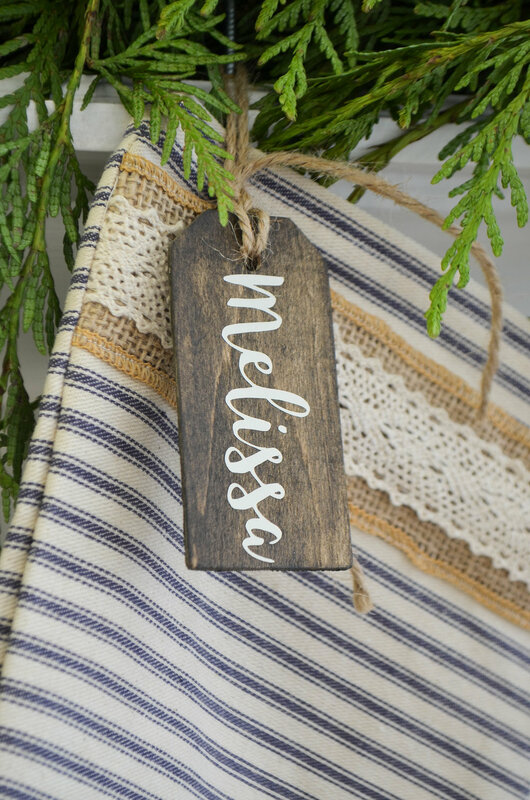 I ordered these custom wooden stocking tags from a cute online Etsy shop, and I'm linking them below. Again, I'm loving the simple rustic farmhouse vibe they give the mantel. One thing I always spring for is fresh cedar garland for the mantel. It smells heavenly and looks even better! We get our garland from our local nursery just down the street. For you locals, it's called Houston Garden Centers. I've also found fresh cedar garland at Whole Foods, Lowes, and Home Depot for those of you looking. Our mantel is 6-feet wide and we buy a 10-foot garland every year to have a little overhang on the sides. It's super affordable too, at only $16. So so so worth it! If you can't find fresh garland, I've linked some faux options below. I'm also sharing all my tips about how to keep live garland looking fresh here. And there you have it, friends! A Simple Farmhouse Christmas Mantel. Do you love changing your mantel up for the seasons? What are you decorating your Christmas mantel with this year? I'd love to hear in the comments below!